Inspired by this post the lovely Katyboo, today I wanted to write something positive about Paris to counteract the awful images we’ve been seeing all weekend. A sort of projecting of light into the darkness, if you will. Luckily, it turns out that, although I blogged about where we ate, the Welcome to Night Vale live show we saw and an amazing bar, I never actually got round to sharing the other photos from our stay. Much like this autumn has been, the end of October/beginning of November was unseasonably warm in 2014, and we were able to enjoy lunch outside and a stroll around some of the sights of Paris. We didn’t have much time, but that didn’t matter. It was a lovely two days spent with my boyfriend and a good friend. Paris will never be my favourite place (sorry, but no big city will ever take that honour – I’m more of a small, quaint places kind of girl), but I have good memories from the times I’ve been there. And that’s something no terrorist will ever be able to take away from me. Check out the multi-coloured boat! Boat race in the fountain! My thoughts are with the people of Paris, and also of all those other countries that are experiencing acts of terrorism and war every single day, but rarely receive as much news coverage as Friday’s attacks did. 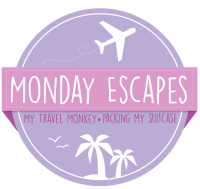 I’m linking up with Monday Escapes again this week. I think we could all use an escape from sadness and hate right now.